We at Insider Monkey have gone over 700 13F filings that hedge funds and prominent investors are required to file by the SEC The 13F filings show the funds’ and investors’ portfolio positions as of December 31st. In this article, we look at what those funds think of Ryanair Holdings plc (NASDAQ:RYAAY) based on that data. Ryanair Holdings plc (NASDAQ:RYAAY) has experienced a decrease in activity from the world’s largest hedge funds in recent months. 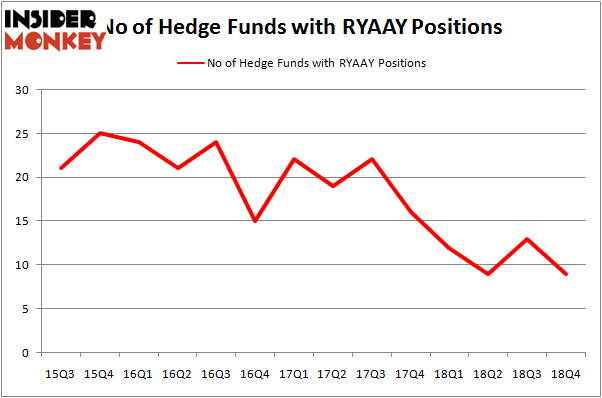 Our calculations also showed that RYAAY isn’t among the 30 most popular stocks among hedge funds. We’re going to check out the latest hedge fund action encompassing Ryanair Holdings plc (NASDAQ:RYAAY). At the end of the fourth quarter, a total of 9 of the hedge funds tracked by Insider Monkey were long this stock, a change of -31% from the previous quarter. On the other hand, there were a total of 12 hedge funds with a bullish position in RYAAY a year ago. So, let’s review which hedge funds were among the top holders of the stock and which hedge funds were making big moves. Of the funds tracked by Insider Monkey, Renaissance Technologies, managed by Jim Simons, holds the largest position in Ryanair Holdings plc (NASDAQ:RYAAY). Renaissance Technologies has a $226 million position in the stock, comprising 0.2% of its 13F portfolio. Coming in second is Woodson Capital Management, managed by James Woodson Davis, which holds a $21.9 million position; the fund has 5.8% of its 13F portfolio invested in the stock. 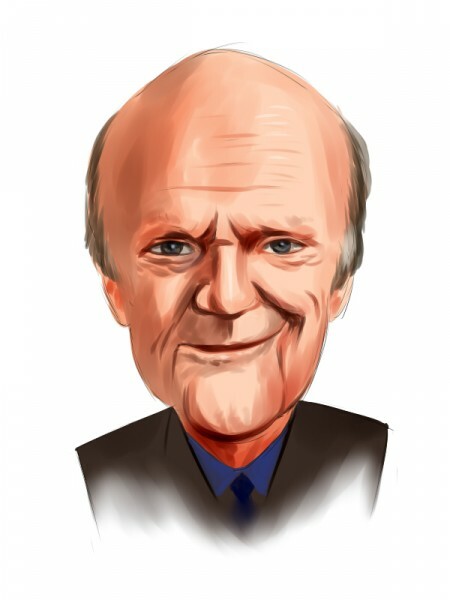 Other hedge funds and institutional investors with similar optimism include Michael Moriarty’s Teewinot Capital Advisers, Julian Robertson’s Tiger Management and Robert Rodriguez and Steven Romick’s First Pacific Advisors LLC. Due to the fact that Ryanair Holdings plc (NASDAQ:RYAAY) has experienced bearish sentiment from hedge fund managers, it’s easy to see that there lies a certain “tier” of money managers that elected to cut their positions entirely by the end of the third quarter. At the top of the heap, Paul Marshall and Ian Wace’s Marshall Wace LLP cut the largest stake of the “upper crust” of funds monitored by Insider Monkey, worth close to $1.6 million in stock. David Costen Haley’s fund, HBK Investments, also sold off its stock, about $0.8 million worth. These transactions are intriguing to say the least, as total hedge fund interest fell by 4 funds by the end of the third quarter. Let’s now take a look at hedge fund activity in other stocks similar to Ryanair Holdings plc (NASDAQ:RYAAY). We will take a look at KLA-Tencor Corporation (NASDAQ:KLAC), L-3 Technologies, Inc. (NYSE:LLL), CBRE Group, Inc. (NYSE:CBRE), and Shopify Inc (NYSE:SHOP). This group of stocks’ market caps resemble RYAAY’s market cap. As you can see these stocks had an average of 29.5 hedge funds with bullish positions and the average amount invested in these stocks was $1007 million. That figure was $285 million in RYAAY’s case. CBRE Group, Inc. (NYSE:CBRE) is the most popular stock in this table. On the other hand L-3 Technologies, Inc. (NYSE:LLL) is the least popular one with only 22 bullish hedge fund positions. Compared to these stocks Ryanair Holdings plc (NASDAQ:RYAAY) is even less popular than LLL. Considering that hedge funds aren’t fond of this stock in relation to other companies analyzed in this article, it may be a good idea to analyze it in detail and understand why the smart money isn’t behind this stock. This isn’t necessarily bad news. Although it is possible that hedge funds may think the stock is overpriced and view the stock as a short candidate, they may not be very familiar with the bullish thesis. Our calculations showed that top 15 most popular stocks among hedge funds returned 19.7% through March 15th and outperformed the S&P 500 ETF (SPY) by 6.6 percentage points. Unfortunately RYAAY wasn’t in this group. Hedge funds that bet on RYAAY were disappointed as the stock returned 6.7% and underperformed the market. If you are interested in investing in large cap stocks, you should check out the top 15 hedge fund stocks as 13 of these outperformed the market.